Rebecca Dickinson’s new retaining wall includes a wide, safe staircase from Fourth Street up to her front porch at 707, and she was hoping it would be ready for Halloween this year, but it was still a semi-dangerous construction zone. Rebecca had to cancel the celebration of her favorite holiday, which she announced with a sign at the end of her driveway promising to return next year – scarier but safer. For many years, the Maughlin House was vacant except for Halloween when it was transformed into a popular haunted house concession for various fundraisers. Rebecca, a nationally recognized children book’s author and illustrator, purchased the empty structure and slowly returned it to its stately stature on the highest hill in Snohomish as a family home. Joseph and Mary Maughlin built the handsome place when they settled here in 1886, and several generations called it home well into the 20s when it passed on to owners outside the family. Rebecca has been in contact with Maughlin descendants who are always curious to see how the interior has changed over the years. And now they will have the new retaining wall and stairs to see. Just as it does today, in 1900, the city solicited bids to grade Fourth Street. Grading the street was at the top of everyone’s list in 1900 since the wider, smoother street would allow access by horse teams pulling the hose and pump wagon in the event of fire – history’s enemy too. Snohomish’s city engineer, Steve Schuller, whom I talked with back in May 2009, when I first wrote about this project, showed me the plans for the new wall, which detail a wide, deep “keyway” footing, plus a “sheer key” below it. “It’s like a keel on a sail boat,” Steve explained. “Plus, unlike the old one, the new retaining wall is reinforced with steel rods. It’s not going anywhere,” he added with a confident smile. This is way too much information for next year’s trick-or-treaters at 707 Fourth Street, I’m sure; but it may interest the future junior goblins to know that Rebecca’s plan is to have them arrive via the new staircase to her front porch and exit down the driveway. She promises an awesome adventure. The Maughlin House, built in 1886, was home for several generations of the family. It’s pictured here during a street grading project on 4th Street. 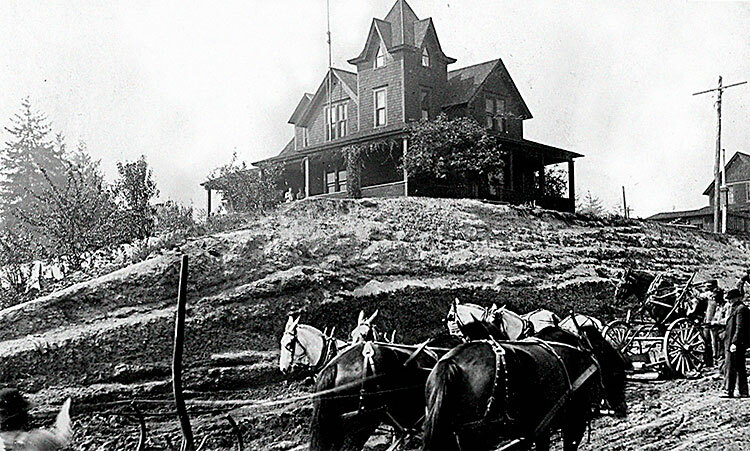 Readers may remember it as the “haunted house” — used as an annual fundraiser on Halloween. Author and illustrator Rebecca Dickinson made the handsome structure a home again in 1992. 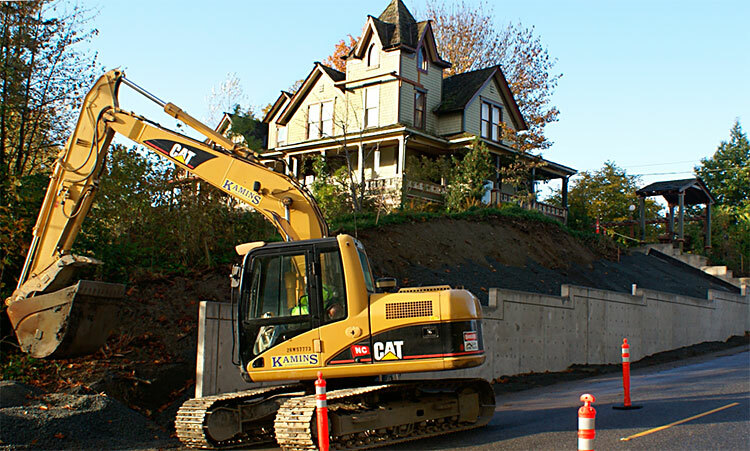 The 1920s era concrete retaining wall was a victim of the 2001 Nisqually Earthquake, which has finally been replaced this year by the city at a cost of $143,000. Kamins Construction of Bothell, the general contractor, is using modern equipment (of unknown horsepower) to add gravel before the sidewalk goes in. This entry was posted in Posts and tagged Maughlin House, Rebecca Dickinson, Snohomish WA history, Steve Schuller on November 23, 2010 by warner.